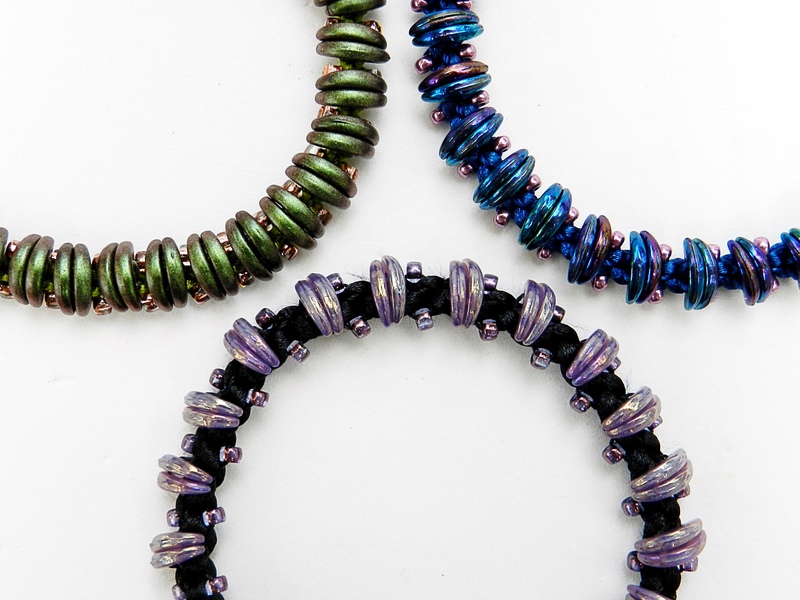 There is a constant flow of new bead shapes coming onto the market, which is very exciting, but they have generally been designed with the beadweaver in mind. Some shapes, such as top drilled Pips and Petals, are easy to use in all sorts of kumihimo designs, but others are less obviously of use to braiders. 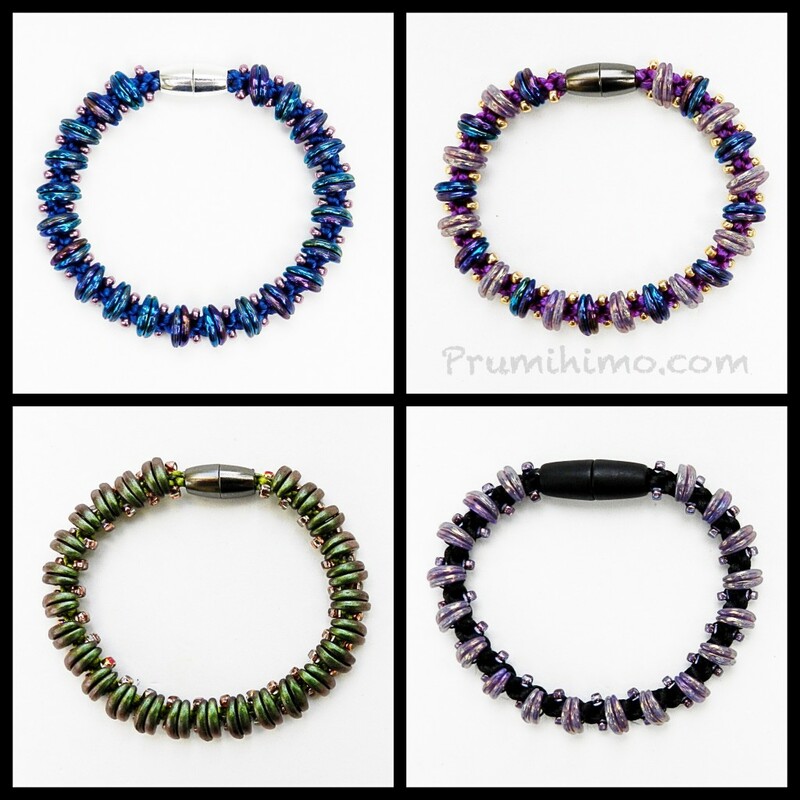 One of the great advantages of my new Prumihimo Disk is that it allows all sorts of beads to be used effectively. Over the coming weeks I plan to release a series of tutorials showing how to use some of the new shapes. Some of these beads are relatively expensive, so as my disk is generally sparing in its use of beads there is a definite cost advantage. Today I am launching the Mystic Moons tutorial, which makes use of the Czech 2-hole Crescent bead. The design features pairs of these fabulous beads on the outer edge of the bracelet, with 2 stabilising rows of seed beads at the sides and a smooth, bead-free inner surface for comfortable wear. The crescents come in a lovely range of colours and finishes, coordinating with other Czech beads, so the only limit is the imagination! I always stress that the braid structure needs to be learnt and practised before embarking on a project. The reason for this is that the rhythm of braiding on the Prumihimo Disk is very different to braiding on the regular disk. Once the braids can be made with confidence it is possible to make up this bracelet very quickly. Threading on the beads is the least favourite part of braiding for most people and with my disk it is kept to a minimum. I believe that most people who try this design will not stop at just one bracelet! Even though the tutorial is now finished and I should be working on something new I just want to make a few more of these before I put my crescents away! If you would like to purchase the tutorial, please just click here.